A collection hailing from one of my favorite eras in Rolling Stones history is spinning in the rock room today at full volume. 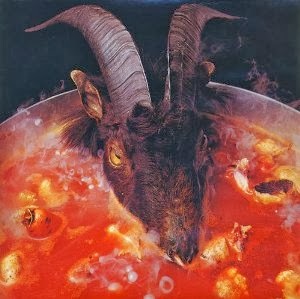 The set It's Only Goats Head Soup, But I Like It is made up of assorted tracks originating from the 1972-1974 time frame. Made up of alternate mixes, unreleased tracks, and deep cuts, this collection is a superior representation of the rare goods available from the era. The compilation features a blend of the edgy rock and roll days explored since the release of Exile and foreshadows the glamorous stadium rock the band would enjoy from 1975 and on. The CD begins with an early rough mix from acetate of 'It's Only Rock and Roll' with surprisingly warm sound quality. To my ears the guitar sounds a bit more up front, and the backing vocals are more pronounced. Slight differences to the officially released version. The next track is another alternate mix, this time of The Temptations ‘Aint to Proud to Beg’ hailing from It’s Only Rock and Roll, and to these ears sounds like the vocals are a bit more upfront, and there are some slight instrumental differences. This track is also an alternate mix. Nice opening to the collection. Keeping with the theme of the release, a Goats Head Soup song follows with the terribly underrated track 'Winter'. Keith Richards does not even appear on the song, but do not fret, Mick Taylor decorates the tune in expressive and syrupy sweet guitar dressings. Again, this is an alternative mix with slight variations in the orchestration and guitar work. Again, an alternative mix follows, this time the classic Stones stomp of 'Silver Train'. The song opens side two of Goats Head Soup and is presented here in what sounds like an early rough mix. The first 'unreleased' song of the collection follows with the Stones covering 'Drift Away', a song first made famous by Dobie Gray. The version here sounds to me like a Mick Jagger solo record, it plays nice enough, but ends up coming across stiff and sterile to this listener. Unique for the rarity factor, but lacking the Stones 'sting'. 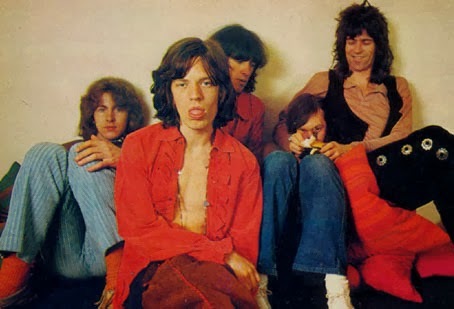 The fantastically groovy and deep Stones cut, 'Time Waits For No One' follows and is the full extended version containing Mick Taylor's sensual guitar excursion. The songs effortless melody and picturesque instrumentation make this version of the It's Only Rock and Roll track a must have for any serious rock fan. Taylor's string journey begins and ends with the songs central ascending riff from which he develops multiple melodic statements. The song would be one of the reasons for Taylor's eventual exit from the band for his lack of songwriting credit on it and other songs he contributed to. Sincere Jagger vocals and a swirling climatic jam spun from piano and guitar are notable highlights. A stand out track both musically and historically. 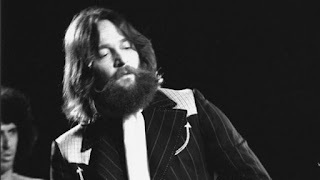 Richards ringing guitar makes a jolting statement in the introduction to the next unreleased track, 'Criss Cross Man' aka 'Save Me'. "Criss Cross Man' stumbles and struts with squishy keyboards by Nicky Hopkins and breathy vocals by Mick. The so-so lyrics may be the reason for this one being left in the can, but there is no denying the grimy groove being laid down by the band and in particular in the pocket, Charlie Watts. 'Through the Lonely Nights' appears and descends like dusk, for years only available on the 7' 'B' side to 'It's Only Rock and Roll'. The song is a wah-wah drenched lament containing the quintessential boozy Stones vocal blend. Worth noting are Keef's perfectly placed and always emotive backing vocals. A wonderful unreleased track, 'Living At the Heart of Love' hailing from the January 1974 Munich sessions makes an appearance and is a surprisingly mature song, with all the Stones hallmarks present. The melody and groove are strong and the band puts forth a muscular performance. This version sounds like a rough mix, regardless, the barrel house piano and slashing Richards guitar come through loud and clear. I am curious to why this one was left to languish in the vaults. The meaty central section of this bootleg release provides a substantial sampling of unreleased goods. The 'legendary' lost Mick Jagger track 'Too Many Cooks' (Spoil the Soup) nestles nicely on this collection. The song remained unreleased until 2007. The Willie Dixon cover also has the distinction of being produced by John Lennon and features a host of rock royalty making up the band. Jack Bruce, Jim Keltner, Jessie Ed Davis, Bobby Keys and Danny Kootch all contribute to the funky and horn bedazzled number. The song carries many of the hallmarks of Lennon's Harry Nilsson produced numbers for Harry's upcoming LP Pussycats. A substantial track with a party vibe, another one left to languish, a testament to the quality and depth of material available to Jagger and the Stones. The remainder of the disc features multiple alternate mixes and one exceptional extended piece closing the set. 'Angie' starts the run and is a dry mix also lacking an additional keyboard overdub. A pleasing and different listen with the missing effects on the vocals. The concluding four numbers are all roughs from preparations for the It's Only Rock and Roll LP, 'Dance Little Sister', 'Til the Next Goodbye', 'If You Can't Rock Me', and 'Fingerprint File'. 'Fingerprint File' is not only an alternate mix but a longer version of one of the Stones finest deep cuts. An additional thirty seconds is added to one of the Stones funkiest moments on record. Bill Wyman's understated bass cements the multiple layers of musical strata. The track slips and slides for a bit over seven minutes through thick riffs, squishy keyboards, ans soulful street smart vocals. A fine and fitting conclusion to the set. While somewhat dated due to the relatively recent release of a couple of the songs in this set, It's Only Goats Head Soup But I Like It is an exceptional collection for compiling these songs in one place. If you love this era of the Stones like I do, having these alternates as well as some 'deeper cuts' in a pleasing running order specific to the era is fantastic. Take a listen, enjoy!